If your diet does not include gluten, grains, or starchy foods.. cauliflower should be your new best friend! It has tons of nutritional benefits (Google them!) with very few calories. Cauliflower also has an incredibly neutral flavor once it's cooked. It can easily replace the rice, potatoes, and flour-y dough in many of your recipes~ while packing them with a nutritional punch. So, now that you've bought the cauliflower...... What are you supposed to do with it!? There are so many options! You can roast it in the oven (like I did with broccoli in this post), steam it with mixed veggies, puree it for a "mashed" consistency, or- my favorite- shred it into "rice"! 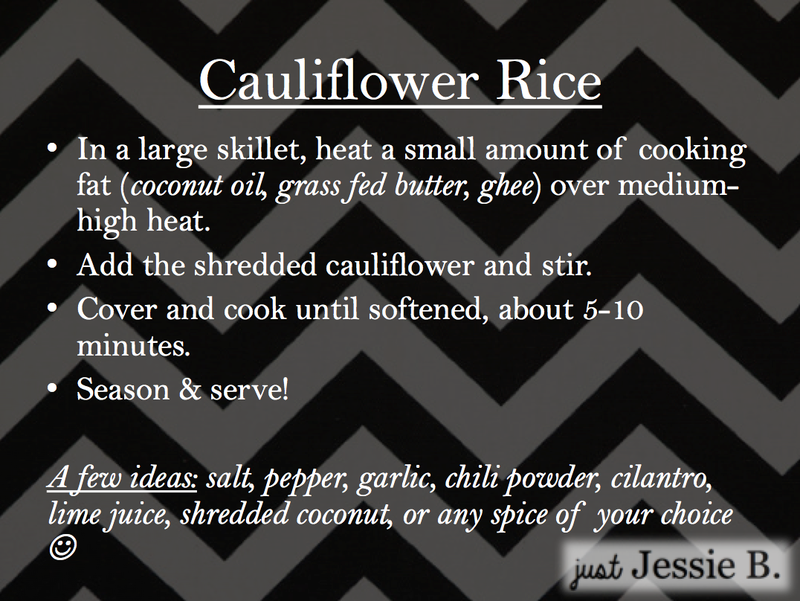 Cauliflower rice can be sautéed & seasoned to enjoy as you would typical rice (see recipe below). It can also be your base for Paleo pizza crust, Cauliflower Biscuits, or any other recipe that calls for "riced" cauliflower. Buy your cauliflower in bulk- you can buy the whole head & cut off the stems, or look for florets where the work is done for you! Shred it in advance, then store it in the freezer. 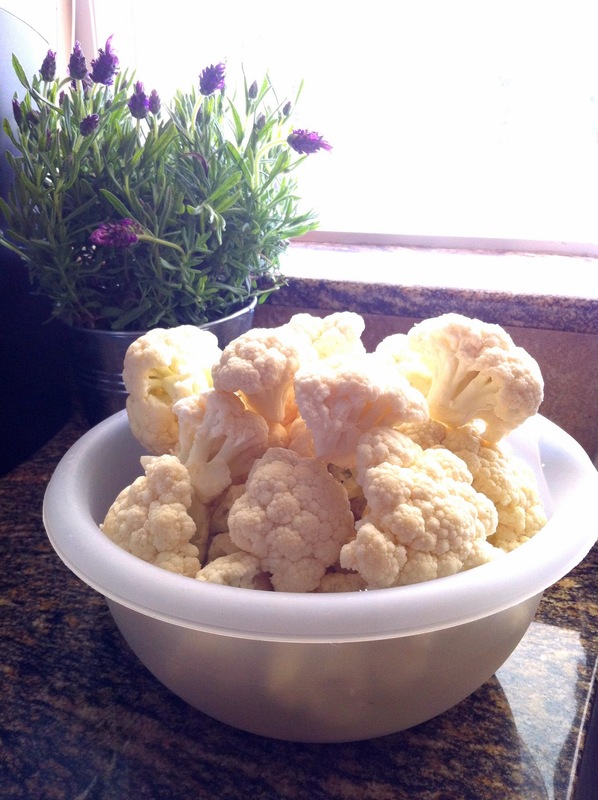 When preparing dishes from frozen, give the cauliflower a few minutes to thaw before throwing it in the pan. Remove the stems from the cauliflower so that you have florets (if not already purchased that way). 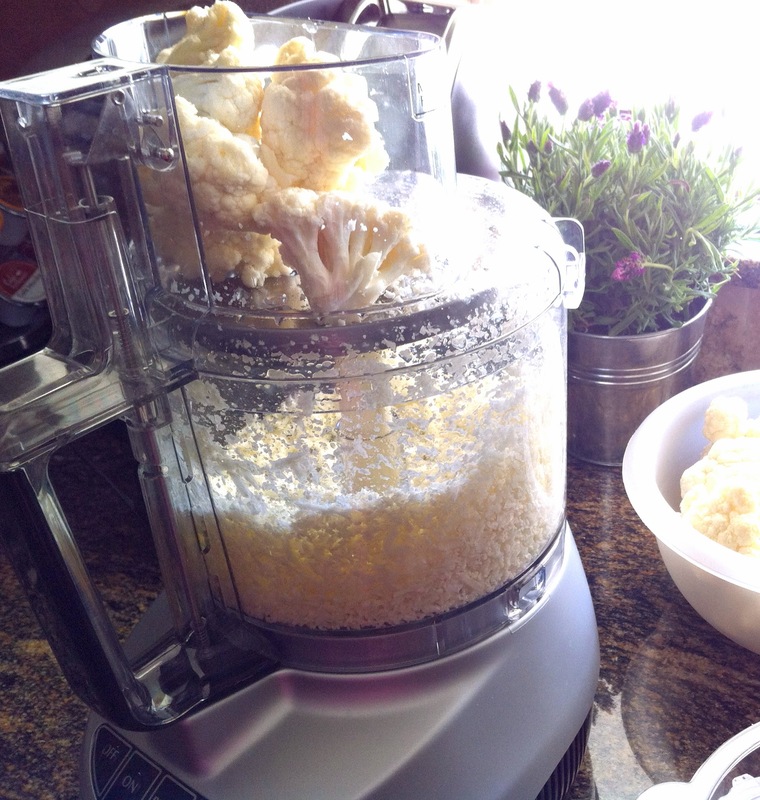 Use a grater/shredder attachment on a food processor, or a handheld grater, to shred all of the cauliflower. Transfer whatever you're not using into freezer-safe Ziploc bags or plastic containers for storing. Plan the shredding process when you have time to do a bunch at once & are planning a dish that calls for it~ that way you're only having to clean up once & will have extras for another day! 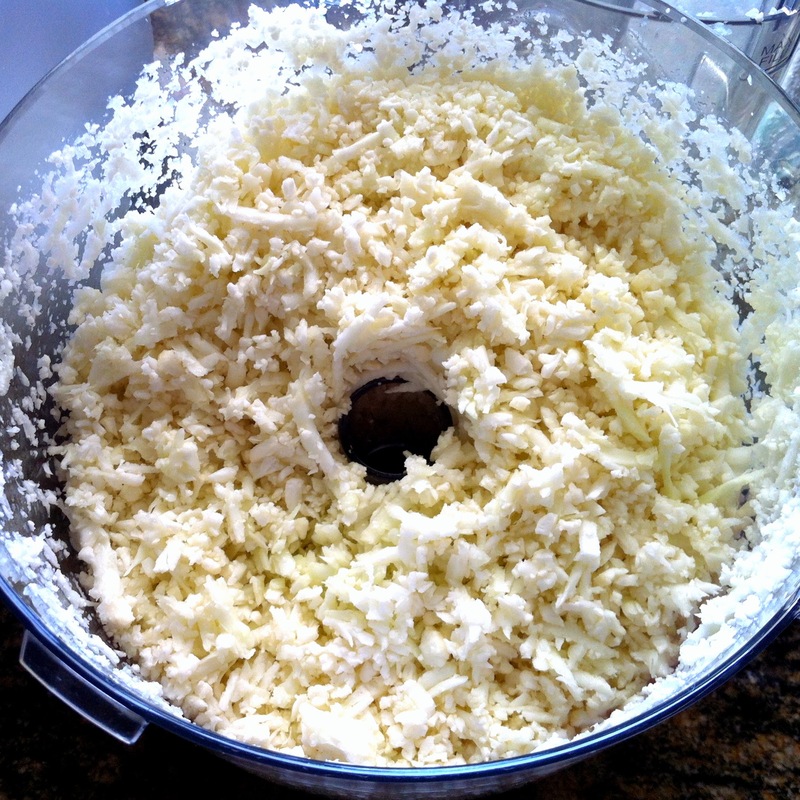 Great tip on freezing the riced cauliflower! I've ben wondering how I could do this. 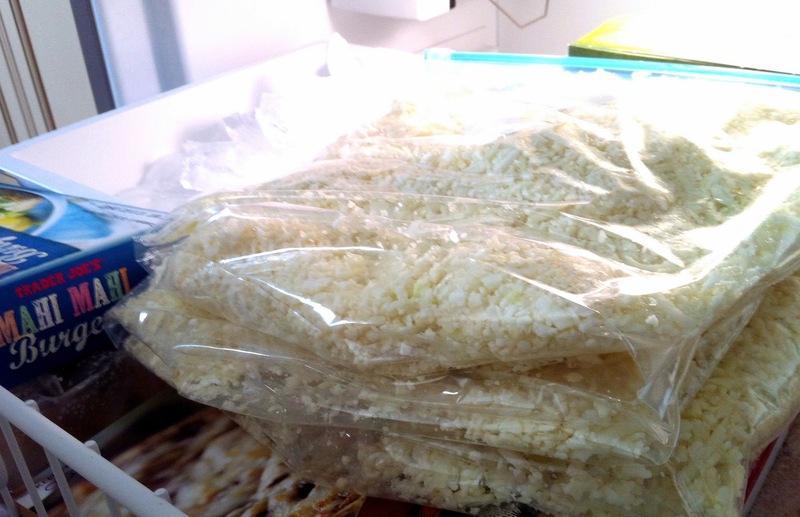 Have you ever tried freezing cooked cauliflower rice? I'd love to have it all ready to go straight from the freezer like I used to use regular rice. Is there a way to do this without a food processor? Thanks! Great idea I just found! What a timesaver, thanks! I don't love cauliflower but I'm trying. I did like cauliflower 'fried' rice and cauliflower crust pizza so that's a start. I love roasted veges so I roasted cauliflower with oil and a bit of balsamic. Thought i would love it but didn't. May have to try again. I have seen this before and thought it was so appetizing but the person didn't explain how they shredded it. Thanks for your method.